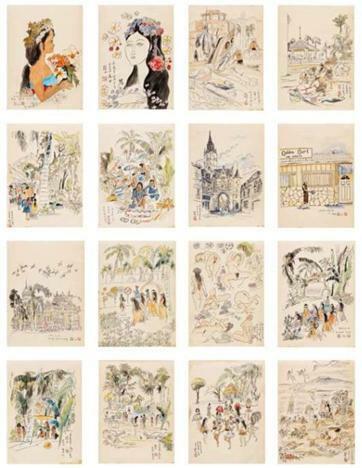 Seoul Auction has withdrawn a book of sketches by Korean artist Chun Kyung-ja that was due to be auctioned Wednesday. The book of 16 drawings by Chun, bidding for which was set to start at 400 million won ($343,000), was removed from the list of artworks Tuesday, just one day before the auction, amid suspicion the sketches may be counterfeit. “An art expert raised suspicion that the sketches might have been forged at a private gathering and it has been spread in the Korean art world. We already had the sketches appraised twice, but since there is a forgery controversy surrounding Chun’s ‘Beautiful Woman’ painting we decided to withdraw the book and have it appraised again just to be sure,” Son Ji-sung, head specialist of the marketing team of Seoul Auction, confirmed to The Korea Herald. The book consists of 16 sketches Chun drew during her eight-month trip in the U.S., Europe and the South Pacific islands from 1969 to 1970. Each drawing is signed with a date. Chun later compiled the drawings into a single book to present as a gift to her friend surnamed Park in June 1983 for his 50th birthday. “We still think the sketches are original works of Chun, but we will have it appraised again in July,” said Son. The authenticity of Chun’s “Beautiful Woman” painting has been questioned for 25 years and Chun’s death last year reignited the issue. Chun had long claimed that the portrait of a woman was forged. The National Museum of Modern and Contemporary Art, Korea, in possession of the painting, has claimed otherwise after it had the painting appraised and confirmed to be authentic. Following Chun’s death, her family members brought the case to the court in order to resolve the long-running dispute between the museum and the late Chun. The “Beautiful Woman” painting was handed over prosecutors which opened an investigation following Chun family’s lawsuit. The prosecutors also took five paintings by Chun currently on exhibit at her memorial exhibition at the Seoul Museum Art on Sunday to examine them as reference, returning them to them museum the next day.